I’m reading through a chronological study Bible. It’s the second time in my life I’ve undertaken to read the whole Bible. I’m struck by different events and things that aren’t talked about much, even sometimes having forgotten those things happened. 2 Then the Philistines took the ark of God and brought it into the house of Dagon and set it up beside Dagon. 3 And when the people of Ashdod rose early the next day, behold, Dagon had fallen face downward on the ground before the ark of the Lord. So they took Dagon and put him back in his place. 4 But when they rose early on the next morning, behold, Dagon had fallen face downward on the ground before the ark of the Lord, and the head of Dagon and both his hands were lying cut off on the threshold. Only the trunk of Dagon was left to him. 5 This is why the priests of Dagon and all who enter the house of Dagon do not tread on the threshold of Dagon in Ashdod to this day. 6 The hand of the Lord was heavy against the people of Ashdod, and he terrified and afflicted them with tumors, both Ashdod and its territory. 7 And when the men of Ashdod saw how things were, they said, “The ark of the God of Israel must not remain with us, for his hand is hard against us and against Dagon our god.” 8 So they sent and gathered together all the lords of the Philistines and said, “What shall we do with the ark of the God of Israel?” They answered, “Let the ark of the God of Israel be brought around to Gath.” So they brought the ark of the God of Israel there. Each city the Philistines took the Ark to had some sort of calamity, so they were quick to get it out of there! In verses 2-5, though, was the biggest impact in my mind. Dagon was one of the Philistine gods. My study Bible says Dagon was the deity of grain, taking care of the fertility of the land and populace, protecting the area from human and divine encroachment, and took care of the royal family. So the Philistines seized the Ark of God during battle and brought it into their shrine or temple for Dagon. See, they believed that when they defeated an enemy in battle, it also meant defeat of the enemy’s god. So when they defeated the Israelites, they believed their god Dagon was stronger than Yahweh, God of Israel. So they sat the Ark beside their image of Dagon. The first morning they got up and went to the temple and found Dagon on its face on the ground in front of the Ark of God. I wonder what they thought then. They picked it up and set it back in its place. The next morning, back they go to the temple. What do they find this time? Dagon had fallen on the ground before the Ark of God again, only this time, its head and hands were broken off. The story goes on with the Philistines passing the Ark around their cities, getting plagues, and finally deciding to send the Ark back to Israel. It can’t get out of there fast enough for them! However, in the send-off, they even made it a test to see if it really was Yahweh (God) Who had sent the misfortune that befell them while the Ark was in their possession. Indeed, it went the way of affirming that it was God. so that those who dwell at the ends of the earth are in awe at your signs. You make the going out of the morning and the evening to shout for joy. 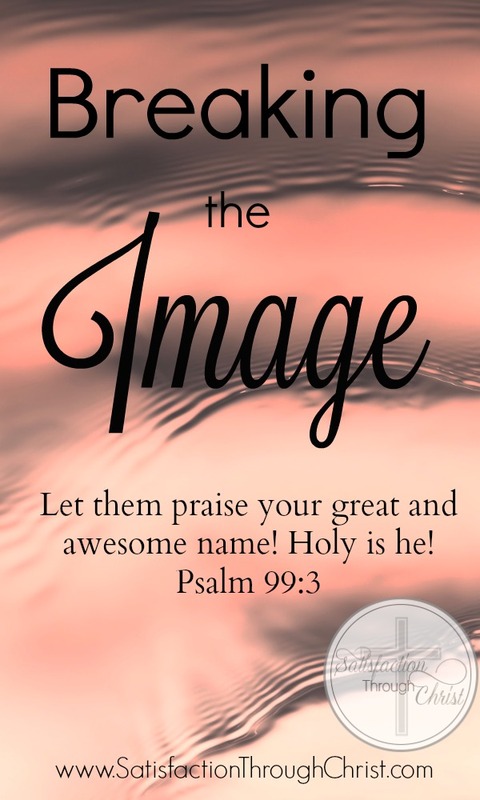 These verses from the Psalms contain awe or recognition of God’s awesomeness, His power, majesty, greatness, and holiness. He is to be feared and revered. This story points me to the awe and wonder of God and His character, and to praise Him for those things. By His grace, we need to break any distorted image we have of God, including anything else we are holding onto or looking to for whatever reason. We need to turn to God in repentance, read the Scripture, and learn about God’s character. Then that reverential fear and awe for God will set in, we will learn to trust in Him alone, and we’ll have genuine praise in our hearts. Holy is He! This was an awesome reading. I have had a year and a half of God rebuilding my marriage, and He is God alone. I know He holds my heart. I do have a greater need to seek Him in all areas. The assurance that no other gods before Him is more true to me than ever. Thank you, Tomeika. Amen – He is God alone. I’m sorry for any pain you’ve had to endure to be in this place, but praise God for the work He’s doing in your marriage and your life. Hugs.